Not all of the walking you do with your dog requires heel position. When going for a casual walk you don't mind if your dog is a little ahead or behind or away from you as long as he is not pulling on the leash. The object of this exercise is to teach the dog that whenever a leash is put on it is to remain loose. Respect for the leash is taught a little differently than other exercises because there is no command given. We don't want to give the dog a command to not pull - we want him to never pull! 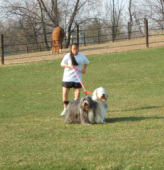 Put a leash on your dog and say "Lets go" to signal him that this is a casual walk, as opposed to heeling. Watch carefully and as your dog moves forward and the leash is about to become taut, give a good firm jerk toward you. Follow with immediate verbal praise. Repeat each time the leash starts to become tight. As you practice this exercise, grip the leash with both hands and move randomly, changing direction, changing pace and occasionally coming to a sudden halt. Done consistently, you will begin to see your dog becoming more aware of you and your movements and no longer charging ahead of you.